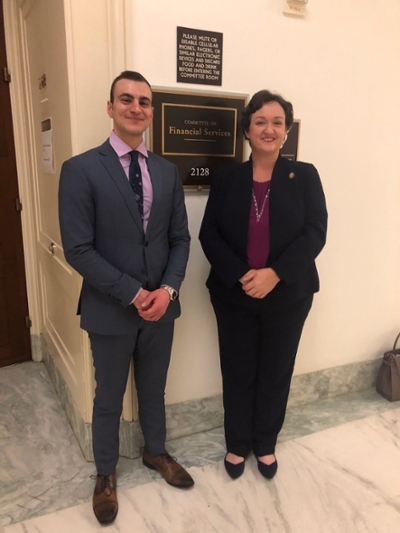 Samuel Maida, left, with Congresswoman and UCI Law Professor Katie Porter. In December, second-year UCI Law student Samuel Maida moved to Washington, D.C. after securing an externship with the Federal Trade Commission as part of the UCDC Program. Before he could begin his externship, the government shut down, and the FTC with it. Working with UCI Law and UCDC, UCI Law Professor and newly elected Congresswoman Katie Porter offered Maida a legislative fellowship in her office. In the role, Maida prepares legislative documents, attends and takes notes at panels about the state of affairs and economy, and attends staff meetings on the Hill. “I was devastated to find out that the shutdown meant I couldn't begin my externship at the FTC, but I was more than thrilled to find out that UCI Law and Congresswoman Porter arranged for a plan B that allows me to get an inside view of the process of our legal and political system,” Maida said. When offered the legislative fellowship, Porter and Maida agreed he would be able to pursue his original externship once the government re-opened. Maida plans to work with Porter’s office until Feb. 19, at which point he will being work at the FTC. Porter, representing CA-45, is the first UCI faculty elected to congress in the 54-year history of the school. She is one of a record-breaking 116 women elected to congress in November.